Edwin A. Stevens was a talented and forward-thinking businessman, but even he could not have guessed that the engineering school he founded in 1870 would one day send significant numbers of graduates into careers on Wall Street and within the financial industry each year. Yet it's true: the Class of 2014 has entered careers in the financial industry at the same rate as they entered careers in engineering services and in technology and telecommunications; only the manufacturing and pharmaceutical industry attracted more Stevens graduates. The number joining the financial industry jumps to nearly one-half for B.S. degree recipients. While most of these jobs are on the technology side, finance has, in fact, become a high-tech industry today. Stevens is also grooming students for careers in trading and investment banking. Stevens began offering a financial engineering (FE) graduate program in 2002, one of the nation's first, at the urging of prospective employers and the financial industry. Originally situated within Stevens' department of mathematics, the FE program was later moved to the School of Systems & Enterprises (SSE) when SSE was created in 2007. 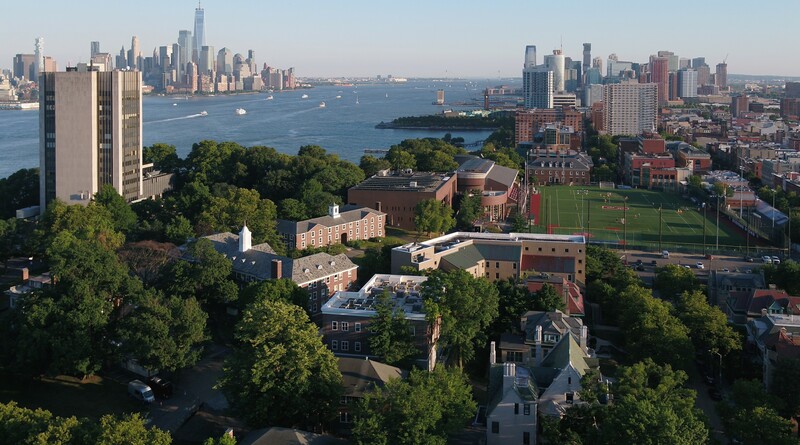 In 2009, Stevens expanded its finance offerings further when the Howe School launched the nation's first undergraduate program in quantitative finance (QF). The program was created, says QF program director George Calhoun, in response to the watershed change that was continuing to reshape the financial industry into an environment where trades were being made in split-seconds, literally almost at the speed of light — often automatically and algorithmically by computer programs. “We responded to the interest of the financial industry when we realized this was a real opportunity for Stevens," recalls Calhoun. The new QF curriculum combined, for the first time, rigorous training in mathematical methods, computer science and business skills such as accounting with training in key finance-industry skills such as asset pricing, stock selection, asset allocation, portfolio analysis and computerized trading, which had by then largely supplanted the traditional trading 'pit'. That same spring, in 2012, Stevens unveiled the Financial Systems Center (FSC), an ambitious new state-of-the-art research center, and the Hanlon Financial Systems Lab — a simulated Wall Street trading room streaming real-time and historical data, a generous gift of investment advisor Sean Hanlon '80. The FSC was designed, from the outset, as a collaborative effort between SSE and the Howe School, anchored by the financial lab. "The Hanlon Lab was the transformative event in the life of the FE program," says Financial Engineering program director Khaldoun Khashanah. "The lab enabled the faculty and students to experiment with real data in an environment that simulates markets." Stevens wasn't finished innovating in finance yet. Over the next three years the university added a finance concentration for business and technology majors; the nation's very first Ph.D. program in financial engineering; an undergraduate major in finance; an M.S. program in finance that is currently accepting applications and will begin this fall; and an MBA in finance. Now student interest in Stevens programs in finance is growing at light speed. Quantitative finance is an especially popular program at Stevens, with a 42 percent increase in applications from 2014 to 2015 and continued growth expected next year. "The impact of technology on finance has been very profound in a very short period of time," notes Howe School Dean Gregory Prastacos, whose office overlooks Manhattan. "No matter how long they’ve been in the field, students coming to us from industry say they can feel the changes brought by technology." The university's Career Outcomes Report for the undergraduate Class of 2014 indicates 13 percent of graduates entered jobs in the financial industry — the same number who entered engineering services positions. For graduates earning bachelor of science degrees, the figure jumps to 46 percent of graduates who entered the financial services industry. Firms such as Goldman Sachs, Barclays Capital, UBS and JPMorgan Chase are among the top employers of all Stevens graduates over the past three years, with JPMorgan Chase making that list for the past five years. “Wall Street is seeking talented young professionals who have an impressive technical aptitude and an understanding of how technology supports the fast-paced demands of the financial sector,” explains Lynn Insley, director of Stevens’ Office of Career Development. John Schwall '95 M.S. '98, a central figure in Michael Lewis' best-selling 2014 book Flash Boys for his efforts to root out unfair advantages in trading and create an alternative exchange, credits his Stevens education with laying the groundwork for his success and innovation in finance. “I think that one of the biggest selling points is how close Stevens is to Wall Street,” adds Doug Stewart '11, a business and technology alumnus who is now an associate with J.P. Morgan Asset Management. "Never underestimate proximity." In fact, every member of the 2014 QF graduating class received either a job offer — entering firms such as Goldman Sachs or BlackRock, with average accepted starting salaries of $71,000 — or was accepted to a graduate program. Financial programming will continue to remain strong going forward. The university's ten-year Strategic Plan, The Future. Ours to Create., specifically identifies financial systems as an area of emphasis and growth, prescribing significant research and innovation in this constantly-shifting field in order "to address issues of stability, resilience and systemic risk of the financial system with rigor and relevance." It's clear Stevens is positioning itself as even more of a player on both the front lines and the IT back-end of the Street for years to come. "As bright and exciting as the past has been, the future in finance looks even more so," concludes SSE Dean Verma.